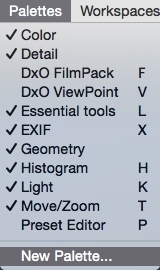 DxO OpticsPro includes many tools for processing your images. 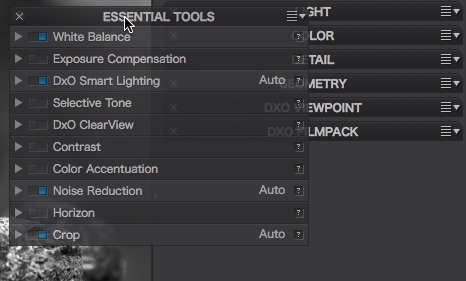 The default workspace in the Customize tab focuses on the Essential tools palette, which includes the principal tools that are necessary for basic corrections. 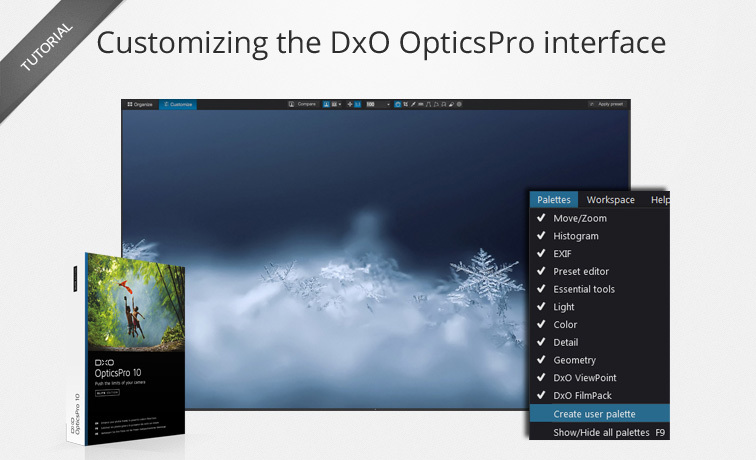 This profusion of tools and palettes may lead you to adapt DxO OpticsPro’s interface to meet your own needs, either by placing the tools and palettes onto a second screen, which will give you more space for displaying your images, or by displaying only the tools that you need. 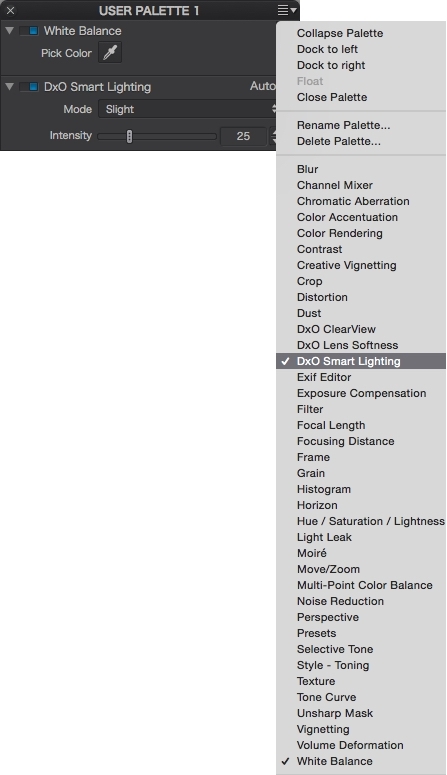 In this tutorial, we will discuss the different options and possibilities for customizing DxO OpticsPro 10. Customize tab, with user-customized palettes (Mac version). In this first part, we will see how it is possible to reorganize, move, and change the display of the palettes within DxO OpticsPro. 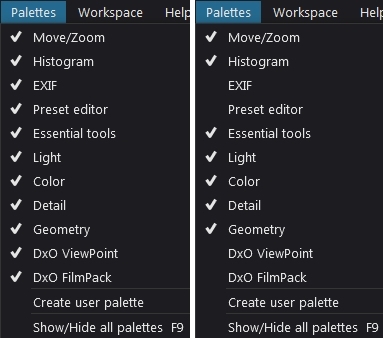 In the default workspace – called DxO Standard – palettes are divided on each side of the Customize tab: left, pallets can be found in general use, such as Move / Zoom, EXIF (display of metadata) and the Preset Editor (Elite Edition). 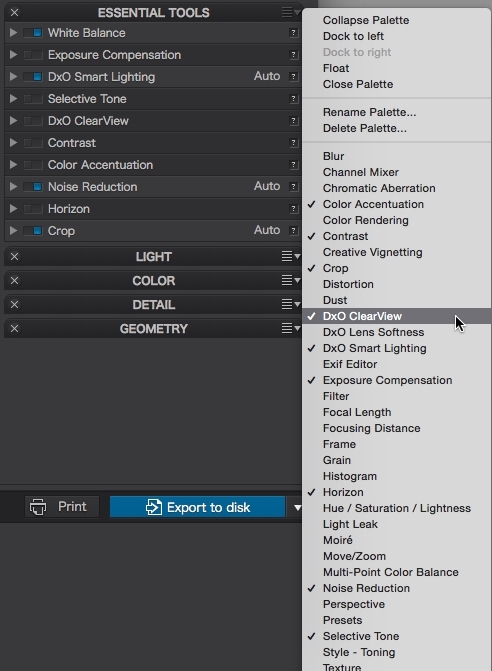 The right pane contains the Histogram, the Essential tools palette, all the tools spread across various palettes, and DxO FilmPack and DxO ViewPoint tools if these programs are installed. 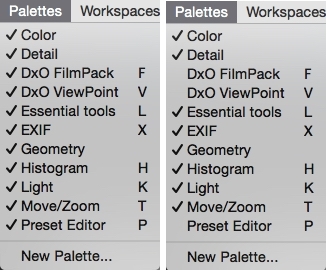 Moving and reorganizing the palettes differs between the PC version and the Mac version of DxO OpticsPro. Use the mouse, but only to move them toward the bottom of the column. After clicking on the context menu icon on the right in the palette header, select Move up or Move down to move the palette up or down one step. 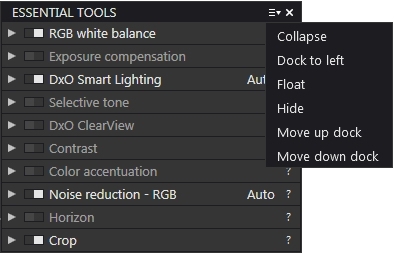 To move them to or from the left pane in the Customize tab, use the mouse or click on the context menu in the palette header and choosing Dock left or Dock right. 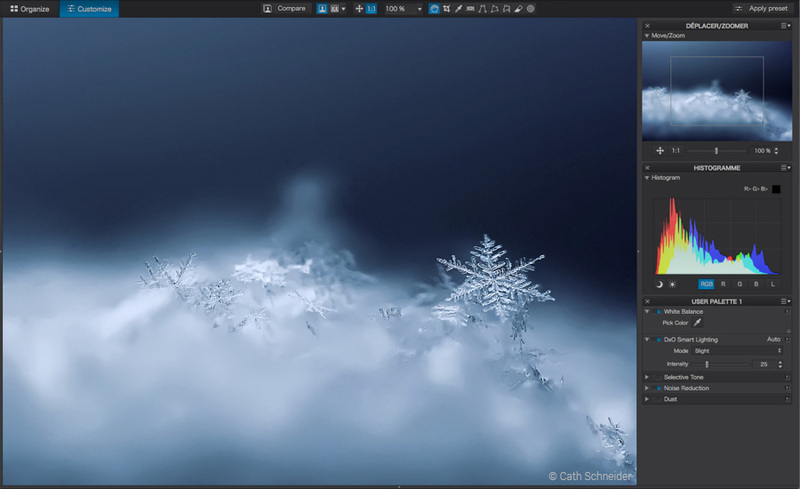 Using the context menu to move a palette (PC version). To move them within the same column, either higher or lower, insert the selected palette between two other palettes. Using a mouse to move a palette (Mac version). Click on the cross on the right side of the palette header. Go into the Palettes menu, and uncheck the palettes you want to hide. Do the opposite (that is, re-check the palettes) in order to display the hidden palettes again. Click on the cross on the left in the palette header. Go to the Palettes menu, and uncheck the palettes you want to hide. Do the opposite (that is, re-check the palettes) in order to display the hidden palettes again. You can also hide the sub-palettes by clicking on the button located all the way on the right in the palette header, and unchecking the undesired tools in the context menu (re-check them to display them again). Context menu for displaying/hiding the sub-palettes (Mac version). If you use a second screen or have a very large monitor, you can save space and give more room to the image you are working on by undocking the palettes and moving them wherever you wish. 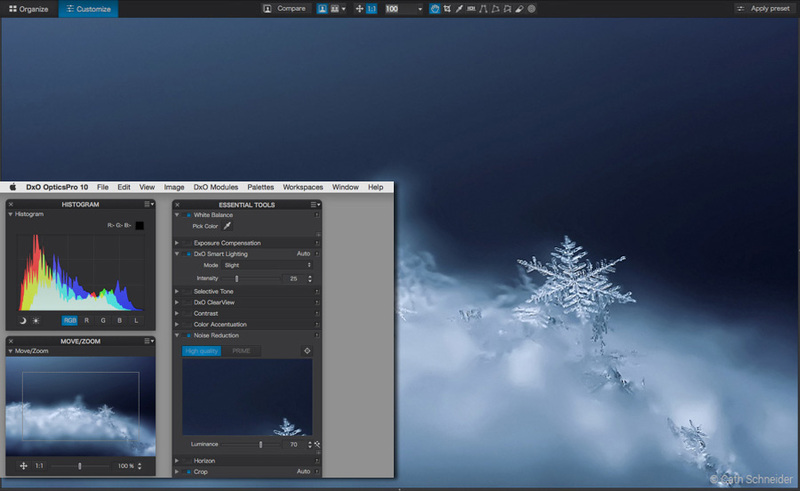 Grab the palette header with the mouse, holding down the left button. Move the palette where you want it. Repeat for the next palette as desired. The position of the palettes is memorized so that you will find them where they were before when you restart the application. Click on context menu on the right of the palette header. Select Dock to right or Dock to left: the palette will be repositioned on the desired side. For PCs, the Dock command returns the palette to its original spot. By contrast, on Macs, a palette that is reintegrated into the application winow will be systematically placed underneath the other palettes, and you will have to reposition it manually if desired. DxO OpticsPro divided between two screens (Mac version). 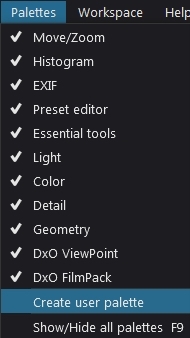 DxO OpticsPro Elite edition lets you create your own palettes, with the aim of grouping together the tools that you use the most, and to arrange them according to your own work methods. This is also an essential step in creating a custom workspace. The method of creating custom palettes differs between the PC version and the Mac version. In the Palettes menu, select new palette. A floating window appears that prompts you to enter a name for your new palette. Click on OK. A new empty palette will appear under the others in the right pane. Navigate in the other palettes, and then drag and drop the sub-palettes you want into the new palette. When you have finished, close the unused palettes (see the second section about displaying and hiding palettes). Entering the name of the new palette. Dragging and dropping the sub-palettes into the new palette. Click on OK. A new empty palette will appear. Click on the context menu icon on the far right of the new palette header, and then check the boxes of the sub-palettes you want to use. You can create as many custom palettes as you want. You can start using them immediately without having to restart the application.